The following system requirements are recommended by PSC Cleaning Systems Inc. for the proper and safe operation of the pressure wash system. PSC Cleaning Systems Inc. assumes no responsibility for proper installation of this equipment. All electrical and plumbing work should be performed by qualified, licensed electrician. All local municipal codes in effect at the site of the installation of this equipment, pertaining to this type of machinery must be followed when installing this system. Select a location that offers a solid, level surface capable of supporting the system. A dry, heated equipment room with drainage is ideal. Proximity to the water supply, electrical supply and cleaning areas are also important. Security, lighting and easy access for service should also be considered.Do not install the equipment in areas where it may be exposed to freezing temperatures. 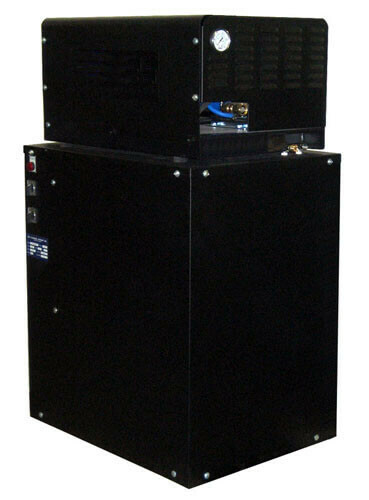 Fused type disconnect for the system, 230/480 volt/3 phase with time delay fusing (check your local code requirements as these may differ from state to state). 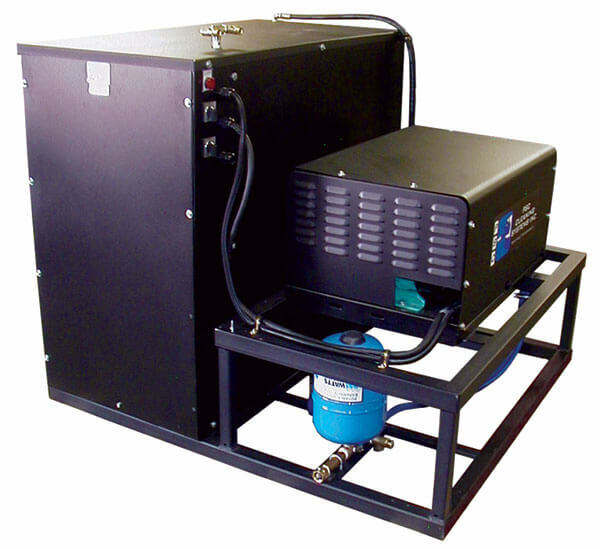 The disconnect box should be located in an accessible area in close proximity to the system for emergency shut-down, and should be clearly marked PRESSURE WASHER. A 1” pre-drilled hole is located at the back of the right side of the machine for the incoming electrical power supply connection. This hole may be enlarged to accommodate the required gauge of wire for the supply. Additionally, a strain relief must be used (not supplied) to ensure a safe and proper connection to the main electrical terminals located in the machine. The main power supply connection to the machine is to be made at the primary terminal block which is labeled L1, L2, L3. The ground wire connection is to be made at the copper ground lug located to the right of the primary terminal block. A constant, pressurized, potable, water supply is preferred. The water supply should meet the total output of the system at all times, with a residual pressure of 30 PSI. Consult the factory if the water supply pressure exceeds 70 PSI. When choosing the water source, consider all other water consuming devices on the supply. Changes in volume and pressure can have a direct impact on one another and may cause system interruption or failure. The inlet connection is a ¾” garden hose fitting. A flexible, non-collapsing hose equal to or greater in diameter than the inlet must be used to connect to the water supply. Never hard plumb the inlet or discharge lines to any high pressure wash system. A water strainer may be fitted on the water supply. When a strainer is used, 80 mesh is recommended and regular checks and cleaning should be performed. If a feed tank is to be used, the strainer should be placed on the supply line to the tank. A shut off valve should be fitted on the water supply, prior to the system inlet, in order that service to the system may be performed. Teflon tape or suitable compound must be used on all threaded plumbing connections to provide a leak tight connection. Corrosion resistant union connections may be used to make servicing easier. Do not use piping or fittings that will rust or corrode as scale or debris will lead to future system failure. If required, connect the high pressure outlet of the system to a distribution piping network via a high pressure flexible hose (not supplied - optional). This hose must have the same inside diameter or greater as the outlet connection of the system (½”NPTF). A shut off valve placed on the main discharge line from the system is recommended for servicing. Use only a valve meeting or exceeding the system operating pressure and temperature. Teflon tape or suitable compound must be used on all threaded plumbing connections to provide a leak tight connection. Arrange the discharge plumbing with ease of future servicing in mind. Use only high quality pipe and fittings capable of handling the system’s maximum pressure. Galvanized steel pipe will prevent corrosion and scaling which can lead to component clogging and failure. DO NOT USE BLACK PIPE OR FITTINGS AS THEY WILL CORRODE. See the preventive maintenance instructions for those All Electric Pressure Washers.